We may not have her to kick around any more, not for awhile at least. But since Sarah Palin resigned as governor of Alaska on Sunday, the new ex-governor has been said to be exploring various options for a life after government. One such option seems almost inescapable: Her valedictory to politics, her goodbye speech formally separating herself from the political herd, was so outlandish, so over the top, so rhetorically unhinged, there’s just one place for Sarah Palin to go — and it ain’t talk radio. Queen Malaprop of the Klondike announced some of her intentions at a weekend picnic in Fairbanks, but kept specifics about her plans private, clearly still animated by the same free spirit that’s boosted her and busted her in equal measure since she joined the McCain campaign last August. She was all over the lot on Sunday, offering a goodbye that was as much View-Master slide narration or the talkover for a PowerPoint presentation made by a chamber of commerce. What followed was a series of “I promised/we delivered” constructions, sentences that detailed the pledges she kept while in office: fish & wildlife stewardship, energy solutions, education and school accountability … and ultimately, Palin made her farewell, a happy-trails-to-you message imparted as only she could. “Our whole big, diverse full and fun family, we all thank you and I am very very blessed to have had their support all along, for Todd’s support. I am thankful too. I have been blessed to have been raised in this last frontier. Thank you for our home, Mom and Dad, because in Alaska it is not an easy living, but it is a good living, and here it is impossible to lose your way. Wherever the road may lead you, we have that steadying great North Star to guide us home. The speculation about her future started almost as soon as she finished speaking. It was announced later that day that she’d accepted an invitation to speak at the Ronald Reagan Presidential Library, sometime in early August. But beyond that, speculation centered on just how big a splash Palin would try to make in the media she’s had a love/hate/hate relationship with for at least the last eleven months. A George Washington University Battleground poll, released Wednesday, shows just how steep a climb she has to make in the mind of the public. The poll found that 42 percent of the public viewed her favorably, 47 percent unfavorably. Two percent never heard of her. Worse yet was a Fox News poll, which found that 51 percent of Americans have a negative view of Palin, compared to 38 percent who think of her favorably. 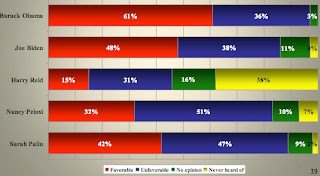 The Fox poll dug a little deeper: What did people think Sarah Palin should do now? About a third of Americans, 32 percent, think the gig for her is as a homemaker, while 17 percent see her as a television talk show host (17 percent). Smaller percentages see her as vice president (14 percent), college professor (10 percent), or president (6 percent). Between now and, say, the end of October, look for the Fox News Channel to announce a new half-hour news and commentary program anchored by … Sarah Palin. The Palin program (not a bad title) will air in the spot previously occupied by Fox reactionary mouthbreather Glenn Beck, who has rather fouled his own nest in recent days. Fox won’t cancel Beck, but his show moves to the side burner in order to accommodate the Alaska phenom. From a conservative perspective, this is right at so many levels. It returns Palin to a medium at which she’s had at least a brief professional experience (as a sportscaster for two stations in Anchorage, in the '80s). It capitalizes swiftly (if predictably) on her continued high visibility in the public eye. It would be a perfect platform to groom her telegenically for campaigns in 2012 and/or 2016. And a TV talk show would be an ideal foundation from which to erect her various political and philosophical scaffolds — a process that should, at the very least, be entertaining television. There’s been talk of Palin going onto a radio show, a la Rush Limbaugh. This would be a mistake. Palin would be wasted on the radio (not the same way Rush Limbaugh’s often wasted on the radio. But we won’t go there). Her visual component of her trajectory into the culture is part of what has made her such a high-wattage feature for the Republicans. It’s way harder to communicate a wink on radio than it is on TV. And going to the medium of radio further weds Palin to the semiotics of John McCain, the phonograph to Barack Obama’s iPod in the 2008 presidential election. For al its persistence into the current century, the medium of radio remains a medium more rooted in the past than the future. Palin should leave the radio to Rush — and Savage and Imus and the other medicated pit-bulls riding the airwaves. That’s not where Sarah Palin wants to go. At least that’s what we think. When the Lager Summit gets under way sometime around 6 p.m. ET tomorrow, Lucia Whalen won’t be there. The person most directly responsible for bringing President Obama, James Crowley and Dr. Henry Louis Gates Jr. together wasn’t invited. And she should have been. It was Whalen’s 911 call to Cambridge police that began the incident in question, and it was widely thought that Whalen was the person whose description of the men breaking into 17 Ware Street included their race. Whalen’s description was seen, initially, as the first racially-tinged fuel on the firestorm of controversy that ensued, leading the nation to a new, rhetorically fractious debate about racial profiling. But no. The transcript — the document at odds with much of the police report as filed by Cambridge police officer Crowley — reveals a 911 call that was, if anything, a model of how to phone in a suspicious activity: a reliance on actual observation; no leaps to conclusions; no assumptions. Lucia Whalen could be a hell of a reporter, if she ever wants to go that way. The strong, quietly proud woman who stood before the media today is no one’s ideologue, no poster child for any cause, not a child of any revolt. This first-generation Portuguese-American spoke from the heart, with the truth and nothing but. For close to two weeks now, we’ve heard great jabbering in the land about the Gates incident being “a teachable moment,” in reference to what we as a nation should have learned about race, assumptions and overreaction. Guess what: In Lucia Whalen, we’ve finally found someone to teach that teachable moment. Image credit: Lucia Whelan: Still from Fox News Channel. In the heat of the summer, MSNBC has been making changes in its lineup, mixing up its daytime on-air talent lately in what’s either a search for the right blend of old hands and new faces to anchor the network’s daytime news coverage (in the sprint to prime-time), or a holding action to get through the summer vacations. The network’s taken another roll of the dice on its early-morning and midday lineups. Recently, a number of special guests have acted as co-hosts for MSNBC programs. Katrina vanden Heuvel, editor of The Nation, tag-teamed Wednesday with MSNBC political analyst Carlos Watson, a regular daytime fixture. MSNBC has also been juggling on-air talent from other parts of the NBC universe. Melissa Francis, a reporter with CNBC (the business channel co-owned by NBC Universal and Dow Jones) has been working for weeks now opposite Contessa Brewer on the MSNBC set. This week, Donnie Deutsch — chairman of Deutsch Inc., a red-meat legend in the world of advertising, and former host of the recently cancelled “The Big Idea” on CNBC — has been subbing for David Schuster on MSNBC’s “Big Picture” segment, acting as midday co-anchor opposite Tamron Hall. It hasn’t always been successful. Deutsch, a man with a hardball, overbearing style, has a way of braying at his co-host and his guests that’s decidedly off-putting. 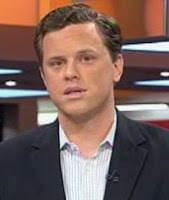 On Monday, MSNBC launched “Way Too Early,” with Willie Geist as host of this half-hour lead-in to “Morning Joe.” Geist’s show, which starts at 5:30 a.m. ET, is being pitched as that indispensable 30-minute digest of everything, from politics to pop, you need to know walking out the door. The taller order will be carving out a distinction between Geist and the other early-morning risers in an already crowded cable daypart. The reliably-caffeinated Dylan Ratigan, formerly of Bloomberg and CNBC, continues his transition to mainstream cable visibility as the host of “Morning Meeting,” MSNBC’s top-of-the-real-morning (9 a.m. eastern) news and analysis show, which debuted on June 29. Ratigan’s show, like most of the others, offers its own news action items for the day ahead — its own bid to be indispensable. There’s more than one way to be indispensable, of course. MSNBC has smartly banked on Americans’ preoccupation with health-care issues, with “Dr. Nancy,” the personal health and news program featuring Dr. Nancy Snyderman, NBC’s chief medical editor, as the host. The show began June 29. The show, on at noon eastern time, is proper to a fare-thee-well, broadcast on a set done in clinical blues and whites, with Snyderman’s sober-sided delivery about like watching paint dry. And maybe that’s exactly the point: in a cablescape crowded with noisy, disputatious knights errant, “Dr. Nancy” stands out as much for what it isn’t as for what it is: a straightforward look at top-of-mind medical and health issues from the perspective of a physician (taking its obvious cues from CNN’s long-running Dr. Sanjay Gupta). Despite her obvious authority, Snyderman doesn’t exactly radiate warmth on camera; there’s something impersonal and borderline brusque about her. She sometimes mangles her TelePromptered lines; her team of producers and camera operators still fumble transitions. And the good doctor isn’t beyond uttering the perfectly silly. In a comment today about obesity in America, she admonished Americans to “stay in the perimeter of your grocery store where the good stuff is,” a statement that’s not so much advice as it is a bromide that belongs in needlepoint on a pillow somewhere. Still, Snyderman’s program dovetails with rising popular concern about health care in the country; as the debate widens in the fall and winter months — a period in which the H1N1 swine flu is forecast to impact the United States — we should be able to expect Snyderman to offer real solutions for families stretched and stressed to the breaking point over health care. If only all of this effort made an impact on the bottom line: TV Newser reported on Tuesday that Fox News Channel was still the one to beat, continuing its dominance in the cable news ratings. Fox topped CNN and MSNBC combined, and exhibited the most growth in the highly-coveted 25-54 demographic. In that cherished cohort, Fox News viewership is up 48 percent in total day viewing, and up 70 percent in prime time compared to the year before, TV Newser said. Image credits: MSNBC logo, Geist, Snyderman: MSNBC. It’s official: President Obama, Henry Louis Gates Jr. and James Crowley will meet on Thursday at the White House, in the first such gathering of its kind, a sort of Hefeweizen Summit made possible (or necessary) by a case of misunderstanding possibly motivated by race, and a voracious media preoccupation with the case and its aftermath — a preoccupation certainly motivated by race. The mainstream media and the blogosphere have been quick to dismiss what might emerge from the grand opening of the Tavern on Pennsylvania Avenue; pol watchers and analysts have already dismissed the very idea of Gates and Crowley being at the White House as a meretricious stunt meant to distract the American people from a stalled health-care reform bill and the woes of the domestic economy. It could have been a marvelous opportunity for merchandising. It’s been reported that the president will have a Budweiser, and Crowley will sip on a Blue Moon. Gates’ spirit of choice isn’t known right now. It’s a missed bonanza for a Crowley tie-in with Guinness; the baller-in-chief apparently won’t be kicking it with an Old English 800. But there’s a basic spirit of fellow feeling behind the idea of such a meeting, a bid for common ground that can’t really be ignored. What the president, Gates and Crowley propose is to tap into the power of the small-group dynamic powered by 16-ounce curls. What’s planned for Thursday may not be much more than a photo-op, but brief as it’s likely to be, it’s also a distillation (literally and figuratively) of the process of American problem-solving. How many times have we tried to iron out our problems, unburden ourselves, unravel our confusions over a beer at the bar round the way? We all have a beer (and usually more than one) to take the edge off of modern life and its velocities from time to time (and usually more often than that). Why is it so off the wall to think in terms of a president and two American citizens from either side of the racial divide doing exactly the same thing? After a bitter and contentious election season, and any number of ugly acrimonious incidents since then, this country could use some way, some avenue to approach race in America that puts the issue in an accessible context: at corner tables instead of think tanks, trading blue-ribbon panels for Pabst Blue Ribbon. And why not? Maybe the big racial conversation that hasn’t happened yet — the one we’ve been pretending to long for since the Rodney King riots in 1992 — needs to be something else. Instead of one big, experted, focus-grouped, televised national conversation on race, we need to have a lot of conversations — millions of racial conversations among blacks and whites and Latinos and Asians at hundreds of thousands of bars and restaurants and taverns across the United States. In ways that no one’s come to grips with yet, the Cold Brew Talks set to convene on Thursday will say as much about us as a nation as about the three men involved, and ultimately far more. Setting aside the kumbaya cosmetics of the moment, there’s a simple elegance about what’s set to happen at the White House, no matter what the outcome is. Almost certainly, Gates and Crowley will agree to disagree. But they’ll do it not in a court of law or on a picket line or testily in the doorway of a man’s own home. They’ll disagree about race with conviction and class, spirit and respect — and they’ll do it over a beer. There’s a lesson there somehow: If it’s possible to do that at the public’s house in Washington, D.C., you can sure as hell do it at the public house down the street. Image credits: White House: Happyme22 (public domain). Beer: Jongleur100 (public domain). 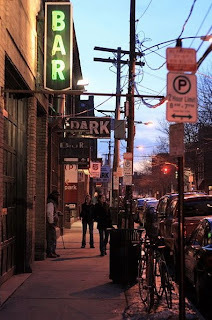 Outside New Haven bar, March 2008: Ragesoss, republished under GNU Free Documentation License. In the matter of Henry Louis Gates Jr. v. Sgt. James Crowley and the Cambridge Police Department now being heard in the U.S. Court of Public Opinion, the groundwork for a settlement may be taking place between the central parties. President Obama, whose comments on Thursday may have made things worse, today performed an extraordinary pivot toward conciliation in the case. “My hope is that as a consequence of this event, this ends up being what’s called a ‘teachable moment,’” he said. 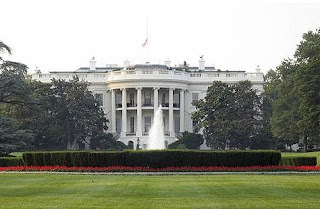 The president closed after mentioning that there’d been some talk of Gates, Crowley and Obama sharing beers at the White House; the president and the opposing parties are said to be comparing schedules right now. Before we got to this point — before there was any talk at all of finding common ground over lager & pretzels — the matter of Gates v. Cambridge PD had basically stalemated over dueling accusations, he said-he said claims and counterclaims. There’ve been clashing allegations that certain statements about what was said between the two men were out and out fiction. Who got it right in this matter, of course, depends on who you talk to. Whether Gates or Crowley was unassailably right, whether either admits to having fabricated some aspect of their account of what happened in a home on Harvard Square, is almost beside the point. The bigger issue is the indisputable fact of racial profiling in America, and the chain of sorry assumptions and rash actions that combine to make racial profiling possible in the first place. What happened to Professor Gates is a sadly universal event for far too many African American men in this country. The police in the city of Cambridge and on the campus of Harvard University have a record of this. 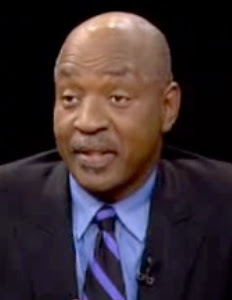 Dr. S. Allen Counter, a Harvard neuroscience professor for 25 years, told The Associated Press that he'd been stopped on campus by two Harvard police officers in 2004 in a case of mistaken identity. Counter said they threatened to arrest him when he couldn’t give them an ID. 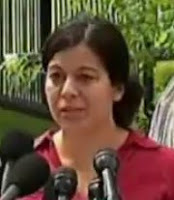 In The New York Times on July 23, Carol Rose, executive director of the Massachusetts ACLU, presented an excellent overview of recent situations which indicate the Gates incident is more of a reality than one might think in Massachusetts’ academic realms, and in Massachusetts generally. 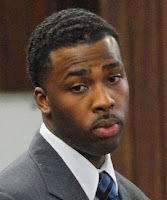 “Maybe the Cambridge police officer was instead following the example set in the case of Jason Vassell, a former student at the University of Massachusetts at Amherst with no previous criminal history. Vassell, an African-American, was recently charged with aggravated assault and battery in the stabbing of two men inside his dormitory. The incident started when the two men, both white, reportedly smashed Vassell’s window while hurling racial epithets at him, then entered the building and attacked Vassel. The two white attackers got off lightly, while Vassell is facing serious jail time. “Or perhaps the Cambridge police thought that they could just ignore the law. That’s what some 40 percent of 247 Massachusetts police departments have done in response to a state law that requires them to track the race and gender of people stopped by police for alleged traffic violations, according to the Executive Office of Public Safety. Do African American men feel that special pang of existential pain when they’re needlessly interrogated by the police? You’re damn straight we do; so sometimes we’re on more of a hairtrigger reaction time about such events than might be warranted. But that reaction doesn’t emerge in a vacuum. It’s history; cause & effect; a malign stimulus provoking a possibly life-threatening response. This is our latest teachable moment. It’s a teachable moment for President Obama, one he’s already made the most of. It’s a teachable moment for white Americans, who are learning (many apparently for the first time) that racial profiling is no hardship myth, or the latest cynical strategy of the aggrieved, but utterly, everyday real. It might be a teachable moment for the Republicans and conservatives in general. There’s no teaching Rush Limbaugh anything. It should be a teachable moment for those Massachusetts police agencies who’d choose to ignore the law, and then assume the role of the deeply offended when they’re called on it. But as racial profiling returns to the front burner of the national attention span (for a hot minute), what’s unknown right now is what may be most important: whether we as a nation accept that, on all race matters, we’ve got as much to learn as we have to teach. Image credits: Gates, Crowley: Stills from CBS News. Counter: people.fas.harvard.edu . Jason Vassell: Bob Stern/The Republican. If not for the name of the principal, it would have been just another anonymous slight against an African American man, one of the uncounted such slights that go down in this country every single day. 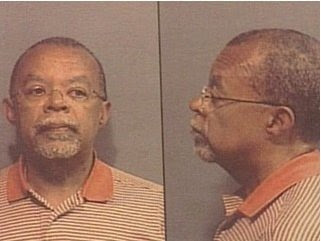 On July 16, Dr. Henry Louis Gates Jr., author, scholar, explorer, publisher, journalist, documentarian, a full-on Renaissance man (Harlem and otherwise), was arrested at his home in Cambridge … for the act of breaking into his own home. But what seemed to be just “one of those things” that happens from time to time in the modern world has assumed wider, societal dimensions for what it says about citizenship, law enforcement and the presumptive weight of race in America. Gates (those of us lucky enough to have met him are asked us to call him Skip) had returned to Cambridge from China and couldn’t gain entrance to his home in Harvard Square, near Harvard University, where he is the Alphonse Fletcher University Professor and the director of the W. E. B. Du Bois Institute for African and African American Research. 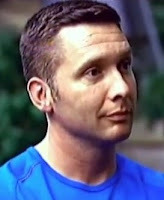 Gates’ driver, at the professor’s request, jimmied the lock to Gates’ front door, an act apparently observed by someone in the area, who called Cambridge police to report a burglary in progress. By the time police officer Sgt. James Crowley arrived, Gates was already inside. Police said he refused to come outside to speak with Crowley, who told him he was investigating a report of a break-in. “Why, because I'm a black man in America?” Gates said, according to a police report written by Crowley. But interviewed today by CNN’s Soledad O’Brien, Gates said he was met by a stony silence from Crowley during the incident. “He wouldn't say anything. He was just very upset. He was trying to figure out who I was. He was looking at the ID. He didn't say anything. And I said, ‘why are you not responding to me? Are you not responding to me because you're a white police officer and I'm a black man? The charges were dropped by the Middlesex County district attorney. Gates’ character would seem to be the same as anyone confronted with such a ridiculous situation: a righteous indignation. But being in the right has never been enough for black Americans, and especially black American men. What would seem to be unassailably evident applied to other Americans in this situation is viewed too often through law enforcement’s narrower and more statistically insistent lens of race, which often yields a resulting spontaneous calculus of suspicion. Too often for men of color in this country, the benefit of the doubt doesn't exist. And it didn’t exist for Skip Gates last Thursday. The deeper problem isn’t with Gates’ response. The bigger matter is how at least the arresting officer, and apparently other officers at that “police convention” out in front of Gates’ home, failed to recognize the name and face of one of the nation’s most visible and preeminent men of letters, a man who lives hard by the 373-year-old university where he’s been a tenured and celebrated professor for 18 years. The Cambridge Police Department failed not a test of character, but one of vision, not recognizing some of the people that give Cambridge its global distinction as a center of learning. We’re not talking about New York City or Los Angeles, with officers blanketing a vast, heaving metropolis of millions of people. The Cambridge police department’s 272 officers and 37 civilians are responsible for a city of about 102,000 people, almost 8 percent of whom are under nine years old. 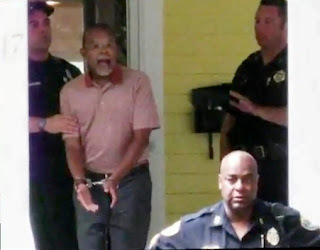 “Whether it was racially motivated or not, he was just amazed that the officer didn't look at the situation, take a deep breath and back off,” said fellow Harvard scholar Charles Ogletree, Gates’ friend and attorney, to WBZ. “The police report doesn't make sense and certainly doesn't capture what happened to Professor Gates last Thursday,” Ogletree said. To WBZ, Ogletree denied an assertion in the police report that there were two men in backpacks. “His driver was in a suit and a tie,” he said. "The amazing thing is the officer just did not believe he was in his home rightfully, even though he saw the Harvard ID and drivers license with the address and a photograph." As you’d expect, we haven’t heard the last of this. The Georgetown University scholar Michael Eric Dyson weighed in Tuesday on CNN: “There is a different universe around which black people and white people rotate. The axis is extremely different. President Obama, a friend of Gates, mentioned the incident at tonight’s health-care-dominated news conference, saying that the Cambridge police had “acted stupidly” in the incident. “Because if this can happen to me in Harvard Square, this can happen to anybody in the United States." The Cambridge Police Review Board, an external board of five civilians that investigates police misconduct, may start an investigation of the incident, WBZ reported. Let’s hope that happens. There are 272 officers in the Cambridge Police Department — part of the 836,787 people the FBI identifies as sworn law-enforcement officers in the United States. There has to be more than one way of looking at a black man. Image credits: Henry Louis Gates booking photograph: Cambridge Police Department via WBZ. Gates arrest, Cambridge police arrest report: Stills from ABC News. Rep. Todd Tiahrt of Kansas takes point in the latest effort of the Republicans to isolate themselves from the mainstream of this nation. With a character assassination that was breathtaking in its scope, Tiahrt spoke July 16 from the floor of the House of Representatives, and showed just how desperate the Republicans have become. Tiahrt had previously filed an amendment with the House Committee on Rules to bar use of taxpayer dollars to pay for publicly-funded abortions in the District of Columbia. The Rules Committee rejected the amendment out of hand. The amendment, co-sponsored by Tiahrt and Rep. Lincoln Davis, a Tennessee Democrat, would reinstate a 14-year-old prohibition on such abortions, a ban that Democrats had removed from an appropriations bill at President Obama’s request. On Thursday he expressed his opinion in the House. “If you think of it in human terms, there is a financial incentive that would be put in place, paid for by tax dollars, that would encourage…single parents, living below the poverty level, to have the opportunity for a free abortion. If you take that scenario and apply it to many of the great minds we have today, who would we have been deprived of? Tiahrt is running for the Senate, cranking up to make a run at the seat being vacated next year by Sam Brownback. You can only hope the good people of Kansas will take a hard look at the candidate between now and November 2010, to see what he's clearly capable of. And then think. Kansans, you deserve better than this. Image credit: Tiahrt: Official House photo. He had a career as a globe-trotting journalist acquired years before he hunkered down in the medium that secured his reputation, but Walter Leland Cronkite really established his bona fides for us on the blue-glow box in the living room, the same device whose importance to everyday people has been transformed by the velocity of modern times, and by that other blue-glow box: the one on your desktop. 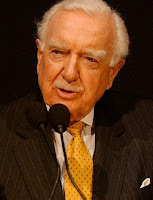 Cronkite, who died on Friday at the age of 92, died three days before the 40th anniversary of the Apollo 11 moon landing (which delighted him), and more than 45 years after the assassination of John F. Kennedy (which brought him to the verge of tears on the air). In 19 years at the CBS Evening News, Cronkite ushered us into those events and more: the administrations of five U.S. presidents, the folly of one war, the assassinations of two of the nation’s best and brightest; and the rich pageant of 20th-century life. His passing brings us to the inescapable: there was television news B.C. and A.C., and the difference is more than mere chronological wordplay. Before Cronkite began his incarnation of the CBS Evening News, in April 1962, the CBS evening news was all of 15 minutes long, not so much a digest of the day’s pivotal events as a snapshot whose content might not be more substantial than the stuff of a chat with your neighbor over the hedge. 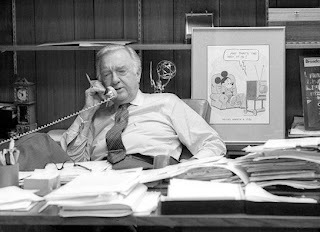 Cronkite helped codify the experience of the evening news, for his network and the others; he helped give the concept a shape and meaning, and a definable personality, affable and avuncular, that the nation could gather around. One of Cronkite’s great gifts to his viewers was the ability to boil down not what was important generally, but what was important to him — and by extension, what he knew would be important to the rest of the country. He distilled the mess of the Watergate scandal down to graphics and plain language that people could understand. He helped make sense of the Iran hostage crisis in a daily chronology that puts things in perspective. It was a statement that broke the back of the nation’s gung-ho military psyche. 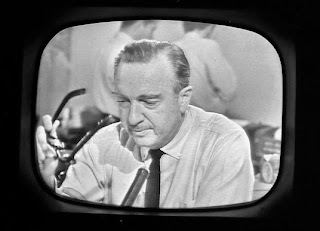 President Johnson said as much after the broadcast: “If I’ve lost Cronkite, I’ve lost middle America.” It was also a statement that probably saved hundreds, if not thousands of American lives, and thousands, if not tens of thousands, of Vietnamese lives. Even a casual look at the mediascape since he left the air, on March 6, 1981, confirms: For the most part, after Walter came the deluge. Before he left the anchor’s chair, Cronkite was witness to the future — a little bit like the vintage car mechanic observing his first fuel-injection engine. CNN, of course, had launched in June 1980, the first all-news, all-the-time venture in the history of the medium, and one that was steadily growing its reach and influence. MTV, which ushered in a new source for music entertainment, another kind of news (that largely bypassed the TV networks that largely bypassed them), was launched on Aug. 1, 1981. In January 1982, after he’d left the scene, CNN launched Headline News, airing a continuous cycle of half-hour newscasts, a style of delivery that continues on the channel today. The Internet we know and love first acquired its recognizable contours when British scientist Tim Berners-Lee invented the World Wide Web in 1989. And after Cronkite’s news went off the air, eventually we got the sleek, relentlessly manicured television news to which we’ve become accustomed … followed by the political caged matches so common on the cable networks today. Cronkite did that in front of about 22 million Americans five nights a week for 19 years. He may well have been the last television news personality who really deserved to be a television news personality. He seemed to wear his authority lightly. He wasn’t just a man comfortable in his own skin; he went out of his way to make us comfortable in ours. He tried to be that neighbor you talked to over the hedge. Ironically, he was also one of the last emotionally accessible symbols of fortress journalism, represented by those mammoth news operations (like CBS) that reveled in maintaining an insulating distance between the press and the public — and a one-way directionality that effectively told people what news was. Those days are over. You won’t get that kind of attention on the Internet or the cable nets; the emotional responses that haven’t been boiled down completely by e-mail emoticons are always about to boil over on the pit-bull shows on cable. And news? Whose news? Yours ain’t like mine ain’t like hers, and that’s a democracy-wall prospect that’s both thrilling and terrifying. Cronkite’s nightly signoff was legendary: And that’s the way it is. And maybe that was Uncle Walter’s big inside joke, for those who watched him long enough. Truth was, that’s the way it was according to Cronkite. And today, the news is the way it is according to you and me. “We are now confronted with a rushing, 24-hour river of information, much of it chaotic and raw, with no one to shepherd us through it,” writes Anthony. But we’ve always been confronted with that river, certainly in the life of our 20th-century time. That river’s always been there for the last forty or fifty years, moving more swiftly every decade, obeying some Moore’s Law of information flow. Maybe we just didn’t know it. Uncle Walter knew it, and he knew it way before the Internet said as much: the world was a nonstop event machine, a tragicomic parade. Cronkite’s role was the same role as performed by news anchors before and certainly since: to pick and choose what stays and what goes; to pull something from that river of information that resonates and breathes and matters, widely and personally. He didn’t do it first, but that amiable, avuncular riverboat captain may have done it the best. Image credits: Top Cronkite: NASA (public domain). Cronkite 1963, 1981: © CBS News. On Thursday at 8:52 p.m. 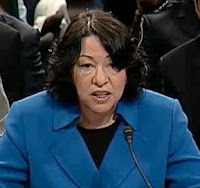 ET, the Senate Judiciary Committee formally ended the confirmation hearings of Judge Sonia Sotomayor, in the committee’s consideration of her qualifications for a seat on the U.S. Supreme Court. The consensus opinion is that, despite the Republicans’ obligatory harrumphing and a needlessly protracted fixation on Sotomayor’s “wise Latina” phrase, the judge will be approved by the committee, moving the issue to the full Senate, which now enjoys a Democratic supermajority. Barring an extinction-level event, Sotomayor will be confirmed in the next few weeks as the first Latina associate justice of the U.S, Supreme Court (and a presumably wise one at that). The relative ease with which this is happening — even South Carolina Republican pepper pot and Sen. Lindsey Graham said this week that barring a complete meltdown by the nominee, his party didn’t have the ammunition to stop Sotomayor’s confirmation — makes you wonder what conservatives in Congress thought would be truly achieved by working to derail President Obama’s choice to replace the retired Justice David Souter. Why all this reflexive opposition; was it all just a show for the bedrock of the party, or a way of making sure they didn’t look like a pushover? Is the GOP that insecure? Or do conservatives feel a need or an obligation to carve out a distinction between themselves and the president’s choice for the high court, even when they can’t really find a distinction sharp enough to slow the confirmation process? 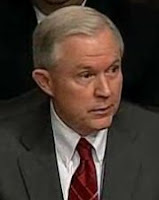 This tic of antagonism has animated American politics from the beginning of American politics; in the hearings just ended, the nation was witness to varying degrees of bad behavior from Graham, Sen. Jeff Sessions of Alabama and Sen. John Cornyn of Texas, actions that reinforce the us-versus-them aspects of our politics, rather than act to overcome them. Many questions hinged on Sotomayor’s judicial temperament, her embrace of “empathy” as a factor in some of her decisions, and of course the words “wise Latina” (a bit of judicial hyperbole Sotomayor used years ago and no doubt mightily regrets right now). But when Graham flatly says that Sotomayor would be confirmed absent a complete catastrophe, the question becomes why Republicans went so aggressively through the motions of partisanship in the first place. If they had substantive objections to Sotomayor’s appointment, that would be one thing. But the attention committee Republicans paid to the cosmetic, the peripheral and the subjective revealed more shortcomings about the Republicans than about Judge Sotomayor and her qualifications. Among those shortcomings facing the Republican Party next year, election year 2010, will be a persistent lack of appeal for Republican candidates by Latino voters. The drubbing the GOP took at the polls in November had much to do with aggressive Hispanic voter turnout, something that’s not expected to disappear next year. Latino Americans are testing their newfound electoral clout in different ways; some Latino evangelical leaders are already contemplating a boycott of next year’s decennial census. It’s a safe bet that the style of the GOP inquiry and commentary directed at Judge Sotomayor will come back to haunt Republicans next year. Rightly or wrongly, Obama’s choice of Sotomayor has been seen as a matter of payback for overwhelming Hispanic turnout for the Democrats last year. Likewise, Latino voters won’t forget the innuendo and patronizing that accompanied some of the senators’ inquiries — or the character assassinations Sotomayor had to endure from conservative media in the runup to the hearings. Two of the most recent examples are two of the most outrageous: MSNBC analyst and GOP museum piece Pat Buchanan howled loudly this week for closer vetting of Sotomayor's LSAT scores (despite the fact that Sotomayor has been on the federal bench for years); last week talk-radio Doberman Rush Limbaugh likened her to a cleaning lady he pledged to buy vacuum cleaners for. “An elephant never forgets,” the saying goes. Neither will the 45.5 million people comprising the nation’s fastest growing demographic bloc. Latinos looking ahead to 2010 will make judgments about how Sotomayor was treated this week. The GOP elephant would do well to remember that. Image credits: Sotomayor: Still from C-SPAN. One hundred years after the National Association for the Advancement of Colored People established and identified itself as a voice and champion of black Americans, President Barack Obama — perhaps the most visible and potent beneficiary of the success of the NAACP’s mission — addressed its annual meeting on Thursday in New York City. The newly-minted president of the United States, fighting two foreign wars and facing serious challenges from Congress on his health-care plan, put on his rhetorical latex rubber gloves and played the role of Dr. Toughlove. In an address that offered a deep, churchy appreciation of what the NAACP has achieved in 100 years, Obama also spoke truth to power when it comes to African Americans owning up to the problems in their own house — our own house — and what must be done to correct them. On Thursday, Obama weaved his usual oratorical spell, noting the NAACP’s formidable history and its origins in a knife-edge time for African Americans. “It was a time when Jim Crow was a way of life; when lynchings were all too common; when race riots were shaking cities across a segregated land. But, the president seemed to say, that line has its dsecendants. Thus were African Americans — and particularly those in the NAACP’s demographic sweet spot, skewing significantly older and more culturally conservative — put on notice that there were no excuses for black Americans stoking ill will against Latino Americans, in the wrong-headed perception that Latinos were taking jobs from blacks. And there were no excuses for blacks continuing to look askance at gay, lesbian, bisexual and transgendered persons within the race and outside it. And no more excuses for young black men and women finding some perverse success in failure. “We've got to say to our children, yes, if you're African American, the odds of growing up amid crime and gangs are higher. Yes, if you live in a poor neighborhood, you will face challenges that somebody in a wealthy suburb does not have to face. But that's not a reason to get bad grades, that's not a reason to cut class, that's not a reason to give up on your education and drop out of school. “No one has written your destiny for you. Your destiny is in your hands — you cannot forget that. That's what we have to teach all of our children. No excuses. No excuses. You get that education, all those hardships will just make you stronger, better able to compete. Yes we can. To parents — to parents, we can't tell our kids to do well in school and then fail to support them when they get home. “You can't just contract out parenting. For our kids to excel, we have to accept our responsibility to help them learn. That means putting away the Xbox -- putting our kids to bed at a reasonable hour. “It means attending those parent-teacher conferences and reading to our children and helping them with their homework. And by the way, it means we need to be there for our neighbor's sons and daughters. “That's the meaning of community. That's how we can reclaim the strength and the determination and the hopefulness that helped us come so far; helped us make a way out of no way. It also means pushing our children to set their sights a little bit higher. They might think they've got a pretty good jump shot or a pretty good flow, but our kids can't all aspire to be LeBron or Lil Wayne. “I want them aspiring to be scientists and engineers, doctors and teachers, not just ballers and rappers. I want them aspiring to be a Supreme Court Justice. The NAACP is challenged like never before in its history, and much of that challenge comes, ironically enough, from the people the organization was created to serve. In recent months, there’s been much discussion in black media of the NAACP’s pertinence in today’s America; some have (rightly) called for the organization to at least consider a name change, an acknowledgment of the long-prevailing existential shift that led most African Americans to stop calling themselves “colored people” generations ago. But regardless of the name, the organization still matters. The NAACP has outlived Jim Crow, the most pervasive era of the Ku Klux Klan, and the very century it was born in. 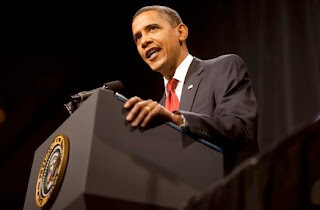 President Obama’s address was a deserved vote of confidence in the NAACP’s next 100 years. Image credits: Obama: White House/Lawrence Jackson. W.E.B. 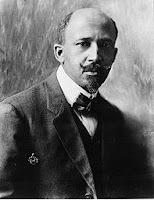 Du Bois: Public domain. 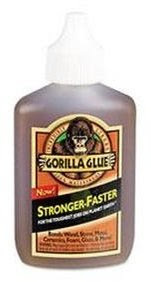 The Gorilla Glue Company is based in Cincinnati, Ohio; among its growing line of adhesives is its flagship product, an “incredibly strong” household liquid polyurethane glue that bonds to and repairs breaks in dissimilar surfaces including wood, stone, metal, ceramics, foam, glass “& more.” The product, which is actually produced in Denmark, contains prepolymized MDI, diphenylmethane-4,4 diisocyanate in a thick, tea-colored, relentlessly effective concoction that’ll firmly bond your fingers to anything they touch. Trust me on that. Zell Miller may learn just how sticky Gorilla Glue can be, in a figurative sense. The former Democratic senator from Georgia made comments today as the keynote speaker at the annual gathering of the American Legislative Exchange Council. He was quoted in a story in today’s Atlanta Journal-Constitution. What he said may have been innocent enough, but given the context and Miller’s proven talent for going off the rails … well, you just never know. Zell Miller’s choice of brands was, ah, curious. Apparently no other name glue would do. Not Elmer’s Glue, not Krazy Glue, not Super Glue, not 3M or Loctite or the names of any other brand-name companies making the same or similar products. Nope, Miller went straight for the Gorilla. Why were masking tape and duct tape kicked to the curb? Why no consideration of construction-grade staples? Miller will mount a seemingly ironclad defense; he merely used a real brand name to make an admittedly inelegant but perfectly legitimate point. In so doing, whether he meant to or not, he became another white Southern male invoking one of the oldest, dumbest and most persistent racist symbols used to impugn African American manhood for generations. We sigh astonished at just how badly a former Democratic senator (one now ardently embraced by the GOP) can go wrong. But hey, it’s no big deal. We’ve always known Zell was still crazy after all these years. We’ve known it since at least 2004, when this fulminating whackjob challenged MSNBC’s Chris Matthews to a duel. Now this. And any man who'll say the word "gallivanting" with a straight face this far into the 21st century ... well, it's anybody's guess what he’ll say next. 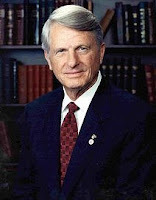 So maybe Zell Miller will go back under the cone of silence from which he emerged today. Rights organizations like the NAACP needn’t waste their time on protests against this. There’re more important things going on. A new American president still has a strong bond with the American people. And those same American people are restoring an old bond, the one they had with possibilities and the sense of an upbeat future. No glue better than that. Image credits: Gorilla Glue: The Gorilla Glue Company. 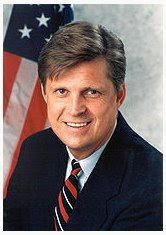 Miller: U.S. Senate photograph (Public domain). The Bay State Banner laid off its 12 employees and shut down on July 9, a week ago tomorrow. If you lived outside the Boston-Cambridge metro area, you probably never heard of the publication, a reliable editorial voice for the interests of African Americans in Boston. The Banner (a weekly) was one of a rare breed, a black-oriented newspaper that had the obstinance, maybe even the sheer nerve, to survive this far into the Internet age first and foremost as a print product. Other newspapers have done the same thing before finally going under, but they were the subsidiaries or divisions of major corporations with presumably deeper pockets. It's a tribute to the pluck and drive of The Banner that it managed to survive longest than some of its better capitalized counterparts in the mainstream media. The Banner was out there on its own, the plucky little engine that could and did, for 44 years. And may do again soon, if one Harvard man has his way. The paper had a print circulation of about 34,000 and a readership of about 150,000. The Banner was launched in 1965, one of the more critical years in the life of the civil rights movement, and went on to chronicle the city’s painful first trial with court-ordered desegregation of its public schools, and the chaos that followed. In today’s carnivorous media climate, what goes around comes around fast. The Banner fell victim to a disease that’s been hitting daily and weekly print publications across the United States all year, from the Ann Arbor News (which is reconfiguring itself as an online entity) to the Rocky Mountain News (whose editorial staffers did much the same thing, independently, when the Rocky went belly-up early this year). If you’re a black or minority independent publisher, what goes around comes around even faster. Already financially disadvantaged by complete dependence on advertisers (usually local), and with no corporate parent to blunt the economic impact to any degree, black newspaper publishers are being more deeply affected by the current downturn. But maybe the Banner has a shot. “Publication is expected to resume,” Miller’s statement said. And they’ve dodged a bullet before, about a year after they launched in September 1965. “But when the community called for its return by pressuring local businesses to advertise, the paper resumed printing,” The Globe reported. For African American journalists, the loss of such community-oriented publications reinforces the sense of professional despair some of them already feel, as exiles from mainstream publications. Historically, it’s been hard enough for black journalists to get hired at newspapers in the first place; the idling of the Banner doesn’t reinforce confidence in the ability of the black print media to make the pivot necessary to survive in these rapaciously interesting times. To its credit, The Banner has had a Web site in place for some years now, one that draws a healthy 1 million new visitors a month. The paper has also made efforts at community outreach; three different magazines — published monthly, quarterly and annually — examine aspects of the health and well-being of African Americans. It’s a good bet that publisher Miller will get the Banner to make like Lazarus and rise from the crypt once more. The Banner fills a screaming need for Boston’s black residents. Charles Ogletree apparently gets this. The celebrated Harvard law professor, author and television commentator is apparently taking point in an effort to save The Banner. For a black press more economically beleaguered than the mainstream media, that’s as good as news gets. Image credit: Bay State Banner logo: The Banner. Ogletree: Still from "Charlie Rose," Nov. 4, 2008 (election night). The folks at fairly imbalanced Fox News have long had a strange and malign preoccupation with matters of race in America. For years now, the rants of mushwit pit-bull right-wing mouthpieces Bill O’Reilly and Sean Hannity have characterized the Fox news style of reporting on various national affairs vis-à-vis race and ethnicity: smug, intemperate, monochromatic, and often flat-out racist. It doesn’t make sense (not that much at Fox News ever does); it’s not even consistent; this is the same Brian Kilmeade who walked off the Fox and Friends” set in March, when he clashed with his co-hosts over some spirited Obama bashing Kilmeade took issue with. 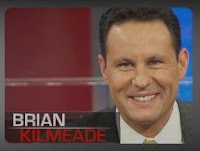 Will the real Brian Kilmeade please stand up? This follows the recent initiative by News Corporation, Fox News’ parent, to create a diversity council in the wake of protests over the recent New York Post cartoon, a scribble that appeared to characterize President Obama as a monkey shot to death on the street by a police officer. Guaranteed, some in Fox News/News Corp management will act chastened and apologize, soberly saying Kilmeade’s outburst hampers Fox News’ drive for credibility. But the throughline of intolerance that runs through the on-air commentaries of O’Reilly, Hannity, Glenn Beck and Neil Cavuto shows a news organization that’s willingly off the rails, no friend to anything approaching objectivity, and one of the more reliably reactionary, unbalanced newsgathering entities in the world. Drive for credibility? Muddy Waters said it years ago: You can’t lose what you never had. Image credit: Kilmeade: FoxNews.com bio page. New York Post cartoon: © 2009 New York Post. The battle lines over the confirmation of Judge Sonia Sotomayor to the U.S. Supreme Court were drawn early and often this morning at the Senate Judiciary Committee hearings. The opening days of such hearings, by acclimation if not custom, are occasions for pleasantries and cordiality; the bloodsport usually starts the second day. But the contours of the fight to come were obvious before the lunch recess. The Republicans — more in the minority than they were before, now that Al Franken has finally been seated as the 60th Democratic member of the Senate — will fight hard to make this nomination about her, the nominee, rather than about her application of the law. They’ve already solidly lined up as a bloc prepared to trip her up on her past decisions, various personal statements and matters related to her life narrative, and how it resonates (or fails to) with conservative thinking. The Democrats will be just as passionate about defending Sotomayor as a judge and legal scholar, and as an American whose life’s journey is both symbolic of the nation’s ideals, and indicative, in both the giving and the receiving, of the empathy she’s already laid claim to as a central pillar of her judicial philosophy. Sens. Jeff Sessions of Alabama and John Cornyn of Texas set the adversarial tone (and perhaps their party’s rhetorical bar) from the start. Cornyn was equally blunt: “[T]he Court could demonstrate renewed respect for our original plan of government and return us, slowly but surely, to written Constitution and written laws rather than judge-made laws. The Supreme Court's recent Second Amendment decision in D.C. v. Heller I think is a good example of that. For his part, Sen. Sheldon Whitehouse of Rhode Island, one of Congress’ more eloquent and articulate members, brought a rhetorical baseball bat to the hearings, then promptly and deftly went upside the heads of Sotomayor’s naysayers specifically, and Republican past practices in general. “In the last two and a half months and today, my Republican colleagues have talked a great deal about judicial modesty and restraint. Fair enough, to a point, but that point comes when these words become slogans, not real critiques of your record. And in a first and brilliant move as a senator, one that augurs well for his career, Al Franken of Minnesota, the panel's newest member, smartly undercut the GOP’s pending attack on Sotomayor’s “empathy” for everyday people in his own opening statements. No matter what you think of empathy as a foundation for American jurisprudence, it was there in the judiciary committee room when Sotomayor made some of her initial remarks, in the afternoon. The risks for President Obama, and even for Sotomayor herself, are fairly small, despite the bluster and empty threat of the outnumbered Republicans. There's no way to demonize this nominee, and the conservatives know it. 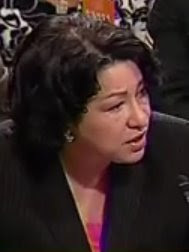 Sotomayor is no fire-breathing ideologue on the bench. It was clear enough when Lindsey Graham of Florida said flat-out: Unless the nominee had a complete "meltdown," she would be confirmed. Graham confirmed what couldn't be said in public: Sotomayor was, relatively speaking, a slam dunk. But Graham didn't get or overlooked something else folks didn't talk about: Ironically enough, the ones really under scrutiny this week are the Republicans themselves. As the hearings play out, the American people will discover just how far the conservatives are willing to go to obstruct the confirmation of a clearly deserving nominee, one who’s undergone scrutiny at this level before. It’s just not good political optics to be seen as mean-spirited toward someone whose personal story is as compelling as Sotomayor’s is. For Sessions, Cornyn, Sen. Tom Coburn and the other Republicans to come across as microvetting her every word and seeking out her every imperfection would deepen the already solid characterization of the GOP as a dirty national acronym. The American people will be watching to make sure the GOP behaves. So will the Latino American people. And on the basis of their steadily increasing numbers at the voting booths, paralleling their increasing percentage presence of the American population — an estimated 45.5 million Americans self-identify as Latino — Hispanic Americans know that Republicans can hardly afford to antagonize a voting bloc whose clout and heritage made themselves felt in November, and won’t ever be ignored again. For Latino voters, the GOP’s got some ‘splainin to do already. “[M]illions of Latinos will watch what for them is a historical event of the utmost political and intimate importance. Many of these Latinos will be watching to see any signs of the racism and xenophobia many Latinos blame the GOP for and voted overwhelmingly against in the last election. Latino voters will, for example, be vigilant about what GOP Senate Judiciary members like Jeff Sessions say before and during the hearings. Image credits: Sotomayor, Frankel, Sessions: From pool feed.